For the English amateur and professional middleweight boxer of the 1950s, and '60s, see Sidney Parkinson. Sydney Parkinson (c. 1745 – 26 January 1771) was a Scottish botanical illustrator and natural history artist. He was the first European artist to visit Australia, New Zealand and Tahiti. 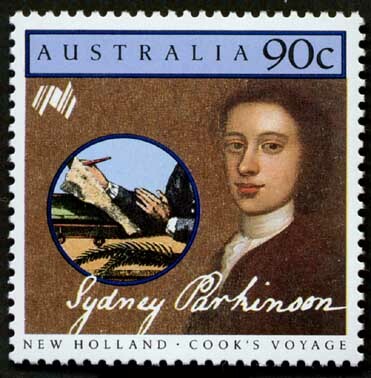 Parkinson was employed by Joseph Banks to travel with him on James Cook's first voyage to the Pacific in 1768, in HMS Endeavour. Parkinson made nearly a thousand drawings of plants and animals collected by Banks and Daniel Solander on the voyage. He had to work in difficult conditions, living and working in a small cabin surrounded by hundreds of specimens. In Tahiti he was plagued by swarms of flies which ate the paint as he worked. He died at sea on the way to Cape Town of dysentery contracted at Princes' Island off the western end of Java. Banks paid his outstanding salary to his brother. Parkinson is commemorated in the common and scientific name of the Parkinson's petrel Procellaria parkinsoni. The great Florilegium of his work was finally published in 1988 by Alecto Historical Editions in 35 volumes and has since been digitized by the Natural History Museum in London. The standard author abbreviation Parkinson is used to indicate this person as the author when citing a botanical name. Wikimedia Commons has media related to Sydney Parkinson. ^ "Sydney Parkinson, botanical draughtsman". Enlarging the prospects of happiness: European travel writing through the ages. Online exhibition. University of Otago. Retrieved 12 June 2015.
de Bray, Lys (2001). The Art of Botanical Illustration: A history of classic illustrators and their achievements, pp. 72, 77. Quantum Publishing Ltd., London. ISBN 1-86160-425-4. This page was last edited on 23 November 2017, at 20:58 (UTC).